Governance & Lobbying occurs iteratively with Requirements Management and Analysis & Design (Options and Solution) and uses the concept of Transformation Debt™. The dotted line around Governance indicates that Governance is performed on us, by the level above. 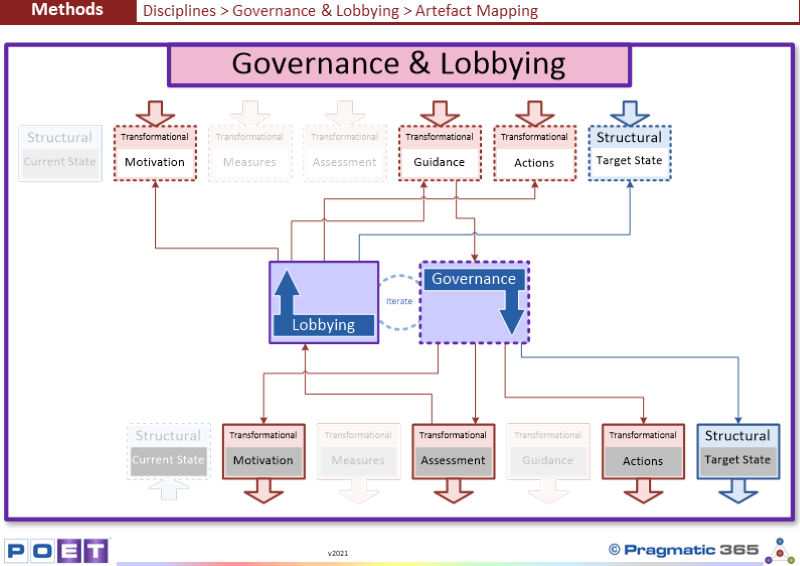 The Solid line around Lobbying indicates that Lobbying is performed by us, on the level above. This ensures we are compliant with the intentions of the phase above. ¨ Guidance from the phase above is taken as an input and an assessment against it is produced. ¨ Either changes are made to the Motivation and/or Actions and/or the Target State to achieve compliance or Lobbying is performed. This ensures that any non-compliances and/or opportunities that are identified, exposed and acted upon. ¨ This is accomplished using the concept of Transformation Debt™ which exposes these non-compliances as Transformation Debt™ Agreements (TDAs) which are part of the Assessment information. ¨ This TDA is then exposed to the phase above as input information, for consideration and decision. ¨ Either changes are then made to the Motivation and/or Guidance and/or Actions and/or the Target State from the phase above to remove the TDA, or the TDA being created is accepted along with its implications. How does this discipline map to your Enterprise? Does the discipline your Enterprise uses include all of these required inputs and outputs? If not, what do you need to change? Who is Responsible for making them? And who is Accountable for making sure the changes are made?